Want to know about toilet training dogs? Find all you need to know about housetraining your dog (or puppy) and look forward to a dry house again! Toilet Training Puppies And Dogs! When you're toilet training dogs, it's best to adopt a structured and consistent approach, especially if you're going to be successful, quickly! 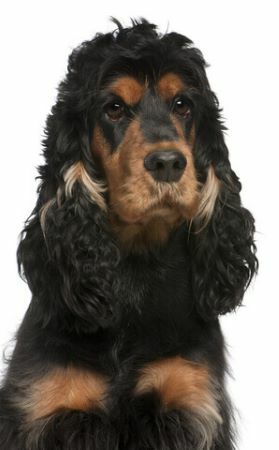 You may be house-training your Cocker for a second time, for one reason or another, or you may have rescued an adult Cocker Spaniel whose toilet habits are not quite up to scratch! However, if you're puppy housetraining you'll probably need to approach the task in a much more detailed way. The main reason for this is because a young puppy won't be able to hold his bladder or bowels for very long at this tender age. Nor will he understand any of your commands, as he won't yet have had is puppy obedience training, and he most certainly won't understand what 'NO' means! Regardless of whether you're toilet training puppies or house-training dogs, I strongly recommend that you read our article on potty training a puppy before you read this page, for a better understanding of the process. 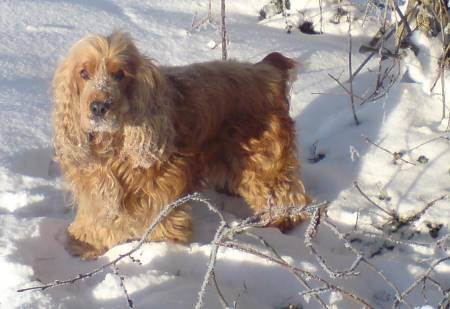 Your cocker spaniel needs to understand that doing his 'toilet' in your home is a definite 'no-no' and to learn that the correct place to relieve himself is outside the home; in the garden and/or during his daily walk(s). It's true that dogs and puppies will try their very best not to soil their own dens which is why crate training your dog can be a great help when toilet training dogs and puppies. Of course, I can't guarantee there won't be any little 'accidents' if you crate your cocker spaniel, although touch wood, our Cocker hasn't yet had an 'accident' whilst in his crate. 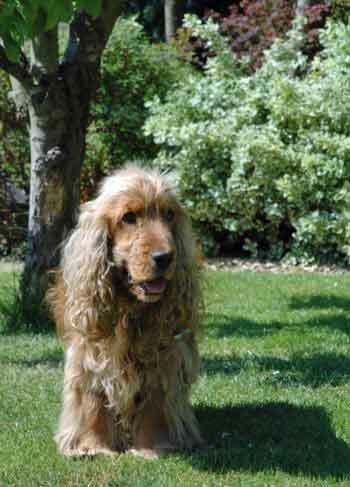 If an adult dog suddenly begins to pee and poop indoors, where he was previously fully house-trained and there hasn't been any upset or change to family circumstances (for example - an additional pack member (human or canine) or moving house), it's important to understand that your Cocker's new behaviour may be the result of an underlying health problem. In these circumstances, I do recommend that you take your pet to see his vet, just to make sure there's nothing medical that needs attending to. Toilet Training Dogs? Try To Catch Him Before He Acts! Come on Mum, I've peed already, now throw the ball! Your dog may cry or whimper at the door, he's asking to be let out. The second you see your dog displaying any of the above signs in your home, let him outside immediately. If you've chosen a particular part of the garden for him to use as his toilet, quickly take him to that spot. Heap loads of praise on him when he gets it right. If he gets it wrong however, and pees or poops in your home, and you didn't catch him in the act, don't chastise him as he won't understand what he's done wrong. Simply clean it up and get on with your day. If you catch him in the act or when he's just about to poop or pee, say 'No' in a firm voice. Your Cocker will link your disapproval with this act, or his intentions, and he'll soon begin to understand what you want from him. Leave it for more than a few seconds and he won't make that link. If you're too harsh with him, there's the possibility that you'll frighten him so much that next time he'll try to hide it; he'll poop behind the sofa or behind the curtains! During the process of toilet training dogs, it's inevitable that your dog will have at least one little 'accident' inside your home, probably on your best rug! Although the spot may look and smell clean to us humans, unless you've used a special urine cleaner, your dog will still be able to smell his urine. Very often, this will encourage your dog to go again in the same spot. I recommend using a specially formulated pet urine deodouriser which can be bought quite cheaply from any good pet store. Alternatively, your vet may sell it over the counter. Another option would be to try a biological household cleaner and white vinegar to eliminate any residual odour. When toilet training dogs it's important to ensure your pet is allowed outside regularly to do his toilet; this will help to minimise any little 'accidents' in the home. I love this snow, even the yellow patches! Praise him when he gets it right and only scold him when he get's it wrong - so long as you catch him doing it or within seconds of pooing or peeing in the house. Never punish your dog for little accidents - all you really need to do is let him know that it's unacceptable to you. We hope you've found this article on toilet training dogs helpful and if you're not yet convinced of the benefits of crate training a puppy or dog why not take a look at our article - we're confident that it will convince you that dog crates aren't cruel and offer many benefits for you and your dog. As mentioned earlier, puppy toilet training will need a more comprehensive strategy - you need a plan! If you follow the advice given in our article on potty training a puppy your dog should be fully house-trained in the blink of an eye!